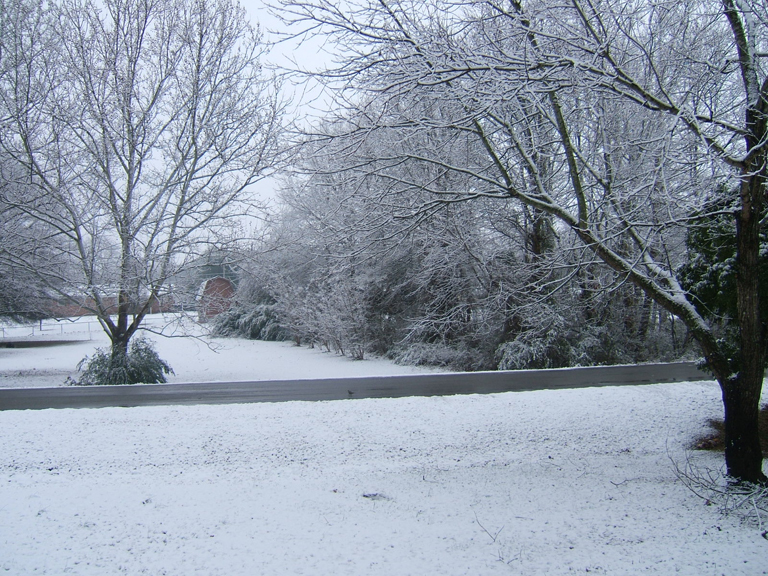 White Christmas in the Deep South! We had an exceedingly rare but beautiful white Christmas. Not a lot of snow accumulation, but enough to enjoy the beauty of a soft, quiet world for just a little while. This area of the country hasn’t had many white Christmases, so this one was special. Most of the snow melted by the end of the day, but more snow came down yesterday to keep it white for a little longer. Christmas dinner was wonderful with my sister’s family and mine together at our house. We had eleven in our country kitchen and spilling over into the living room. We gladly gave up our dining room when we moved here, but I’ve calculated that I can serve a maximum of 14, inside and seated. If you throw in the screened porch in good weather, it could be more than that. And the dogs had a splendid visit from Santa. 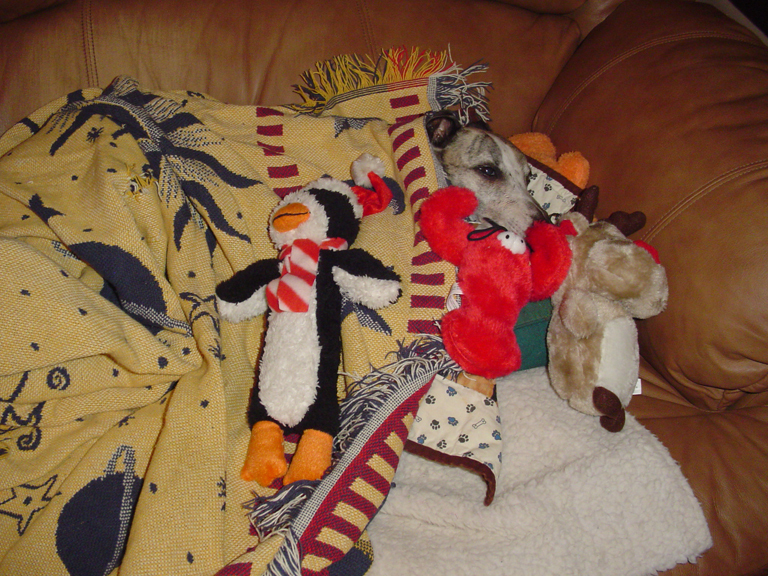 Here’s Abby, getting ready to take a nap with her new toys. I hope you’re getting some special time with your friends and loved ones. We too had a white Christmas but that is normal for the northeast, the next day we had a blizzard! I am sure we will all be inspired in the new year 2011. Pat, I’m always inspired by the new year. It feels like a brand new beginning, but January is also a nice quiet time for thinking and doing as one pleases. I love it. Enjoy your son while you have him there! Happy New Year. Here in Charleston we had a white Boxing Day- quite rare, I’m told. We even had some accumulation that lasted til late the following day. Such a wonderful holiday gift for the South! It really is, Stephanie. I’m sure ours is so much better than for those who have to dig their cars out. We had very few problems on the road, and that’s a blessing. A beautiful sight! Wish we had such a slight powdering of snow, we had about 6″, but we’re lucky, compared with New Jersey! Yes, I’d say your 6″ was plenty. Our northeast has had a big mess with stranded people trying to get back home.